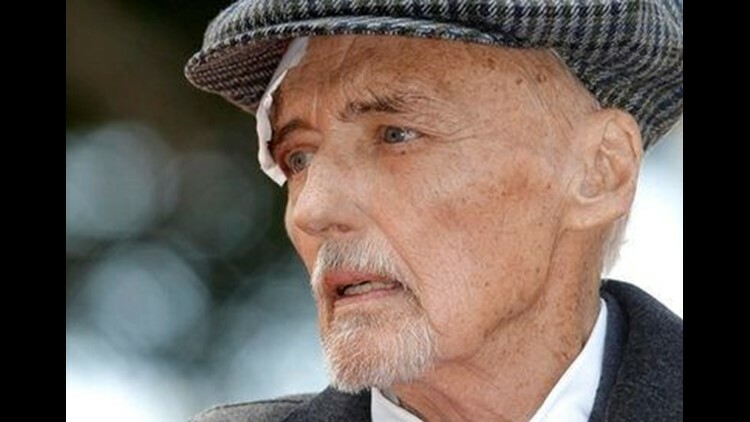 LOS ANGELES (AP) – A bandaged and frail Dennis Hopper was surrounded by friends, family and colleagues Friday as he was honored with a star on Hollywood's Walk of Fame. The 73-year-old actor and filmmaker, who is battling prostate cancer, appeared gaunt and was helped to the stage by a friend. Hopper explained that bandages on his right arm and eye were the result of a fall Thursday outside his home. The two-time Oscar nominee, who has appeared in more than 100 films, said he came to Hollywood from his native Kansas at 18, "so that was my college." As Hopper was speaking, a Hollywood tour bus passed slowly by the sidewalk ceremony and the tour guide said over the loudspeaker, "We love you Dennis." Jack Nicholson, Viggo Mortensen, David Lynch and Dwight Yoakam were among the luminaries on hand to honor their friend and colleague. Nicholson wore a shirt decorated with images from "Easy Rider," the classic 1969 road film Hopper wrote, directed and starred in, alongside Peter Fonda. Mortensen, who kissed Hopper on the cheek before approaching the microphone, called his friend of 20 years "a complete and fertile artist" who has been "a constant source of ideas, inspiration and humor for his friends and colleagues." Another longtime friend, producer Mark Canton, said Hopper is "the coolest guy on the planet," which elicited a broad smile from the ailing star. "He is a force of nature," Canton said. "He is a world-class original, a legend in his own right, whose impact on the arts and people that he loves so dearly is second to none." As Hopper's star in front of the historic Egyptian Theatre was unveiled, the actor's 7-year-old daughter, Galen, threw her arms around her father's neck. Hundreds of camera-toting spectators lined Hollywood Boulevard for the 30-minute ceremony. Hopper and his wife, Victoria, have been locked in a contentious feud since he filed to end the couple's nearly 14-year marriage in January. Earlier this week, Hopper's attorney said the actor is terminally ill and too weak to be questioned by his wife's attorneys in a deposition. Doctors approved his appearance at Friday's ceremony because the event was a positive experience.